Sriz Beauty Blog: Second Blogiversary Giveaway with Inatur Herbals - Closed!!! Second Blogiversary Giveaway with Inatur Herbals - Closed!!! As you all know that Sriz Beauty Blog has completed two successful years on this March 9th and this wouldn't have been happened with out your support and love! As a token of appreciation,We would like to giveaway two skin care hampers from Inatur Herbals,which is one of my most favorite skin care brands.I have used many of their products and honestly each and every product is amazing!! !So,I would like to gift few of their best selling products to two of you!!! 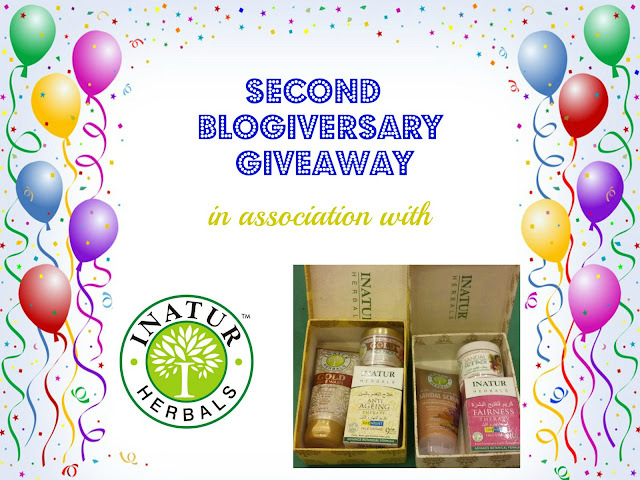 Second Blogiversary Giveaway with Inatur Herbals!!! There will be two winners one winner from facebook and google+, second winner from twitter and Instagram! So, one can participate in both or either one! To enter into the Facebook Giveaway,you need to complete the following steps. 1) Like Sriz Beauty Blog on Facebook here and Google+ here. 2) Like Inatur Herbals On Facebook here and Google+ here. 3) Tag 3 friends and ask them to like both the facebook pages and share about the giveaway on your facebook and google+page.The more you share,the more your chances of winning. To enter into twitter and Instagram Giveaway!!! 1) Follow me on Twitter here and Inatur here. 2) Follow me on Instagram here and Inatur here. 3) Share this on your twitter and Instagram tagging 3 friends. Use hashtag #srizInaturcontest while sharing and comment below that you have participated or else your entry won't be counted! b)The giveaway is open till April 25th and winners will be announced with in 1 week after the contest ends. Prizes will be shipped directly to the winners by the brand!